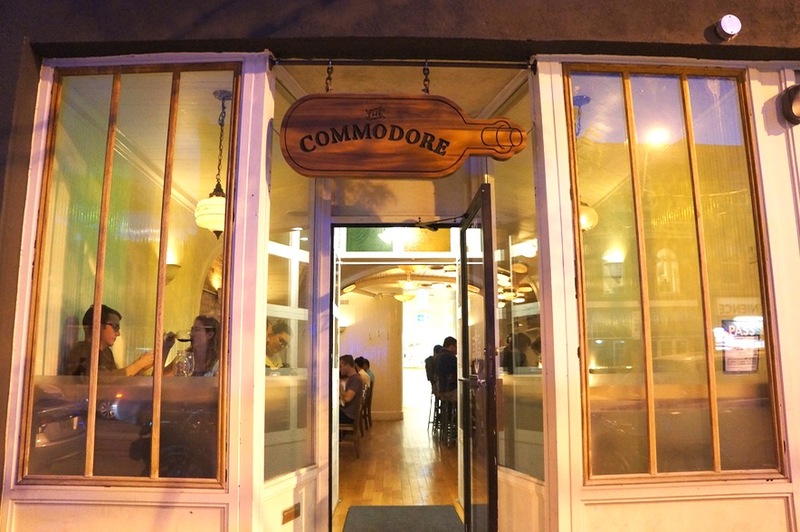 Since opening up in Parkdale a year ago, I had been meaning to check out The Commodore (@TheCommodoreBar). But it certainly wasn’t for lack of trying – a primetime reservation is hard to come by. The restaurant isn’t very large so there are only a handful of tables that can be reserved. Window seats and bar seats are saved for walk-in’s. We popped in on a Friday evening just after 6:30 and grabbed a seat at the bar as the six or so window seats were already taken. As the evening went on, the restaurant filled up and we saw a number of groups get turned away. It’s a very popular restaurant…and for good reason! 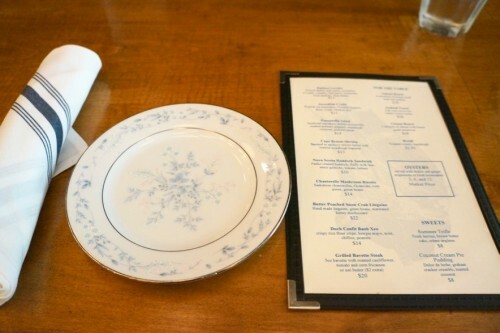 Upon entering the restaurant, you definitely get the sense of its nautical theme – but without all the tackiness. The planked walls and ceilings are painted white and the ceilings have swooping curves which make you feel as though you’re on a boat. While the sun was still out, the sunshine filled the space, giving it a very light and airy feel. But once the sun set, it made for a very cozy space. Perfect for a date. The Commodore is brought to us by co-owners Jason Romanoff and Chef Jon Vettraino. They’ve created a menu of small sharing plates, many of which are seafood-focused including a halibut ceviche, snow crab linguine and a seafood tower. We were tempted to order the seafood tower but there were too many other items on the menu which piqued our interest. First up was the Swordfish Crudo – pickled sea asparagus, Trinidad peppers, shiso, crispy chicken skin ($13). 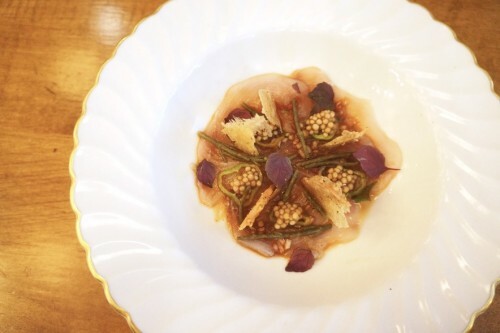 The dish consisted of four thin slices of raw swordfish topped with a unique combination of ingredients and textures that had me quite curious as I read the description on the menu. It turned out to be a delicious few bites to begin the meal. However, with so many flavours in the dish, it was difficult to detect the swordfish. It was a little too delicate to stand up to all the different flavours and it didn’t seem like the swordfish was the star of the show. Regardless, it was still a dish I’d happily order again. 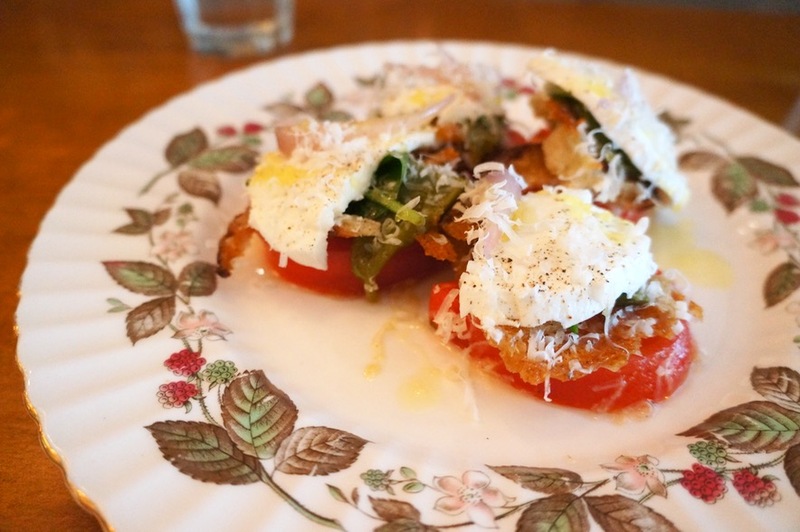 Up next was the Heirloom Tomato Panzanella Salad – bufala mozzarella, pickled ramps, roasted poblano peppers, toasted sourdough ($14). Wow, this was one hell of a salad and one of the highlights of the meal. I rarely ever order salads so it’s a good thing Mike pushes me to order one every now and then. The tomatoes they used were fantastic – they had such an intense tomato flavour which makes me think that we really need to start buying better produce at home… With the pickled ramps and roasted poblano peppers, it was a really great take on the panzanella salad. The third dish to arrive was the Cape Breton Shrimp – with anchovy brown butter sauce on sourdough baguette ($13) which was another home run. 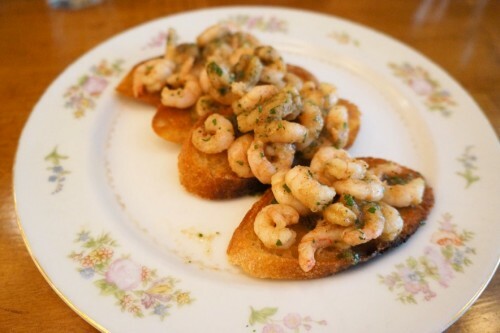 An order came with four portions consisting of a heaping pile of buttery shrimp soaking into a slice of sourdough. It’s not easy to eat but well worth the mess. We were definitely licking our fingers afterwards. Up next was the Duck Banh Xeo – duck confit, crispy rice flour crepe, kewpie mayo, chillies, mint, peanuts ($14). 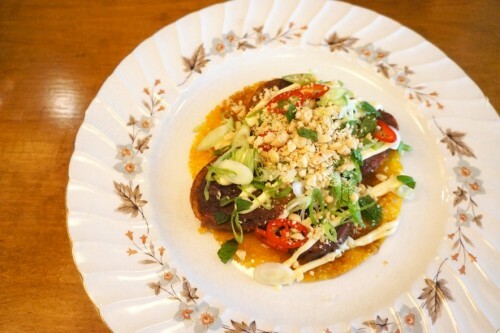 The dish consisted of tender slices of duck confit sitting on top of a paper-thin Vietnamese-style crepe. Topped with Kewpie mayo, chillies and peanuts, this was a delicious explosion of flavours and textures. 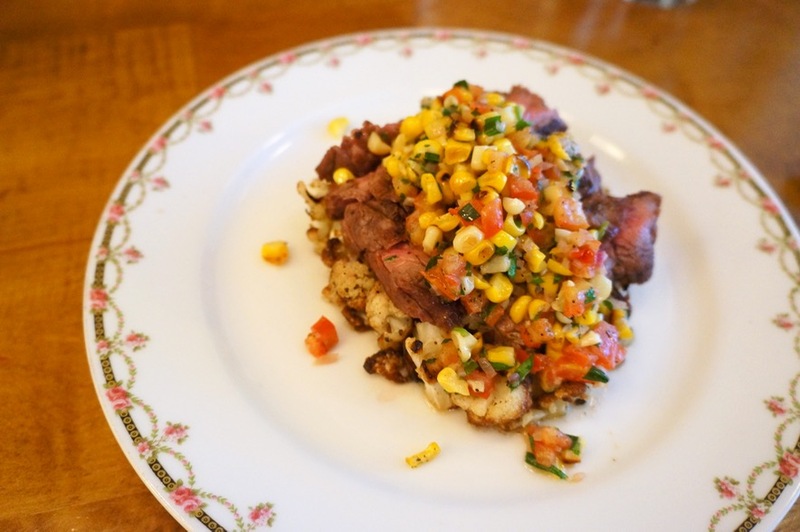 The last and most substantial dish of the evening was the Grilled Bavette – 5oz bavette with roasted cauliflower, corn & tomato fricassee ($20). You can get it with uni butter for an extra $2 and to be honest, it was the main reason why we wanted to order the dish. Unfortunately, we completely forgot to order the uni butter and only realized it when the dish arrived. Nevertheless, it was a solid dish. The steak was cooked to a nice medium rare, and although this isn’t the most tender cut of meat, it’s very flavourful. The corn and tomato fricassee was a nice light accompaniment and overall, we both enjoyed it but I still couldn’t help feeling disappointed that we missed out on that uni butter. This evening, they were offering two desserts, a trifle and a coconut cream pie pudding. I usually like to end my meals off with something sweet but the steak at the end of the meal really did us in. Overall, we had a really great evening at The Commodore. 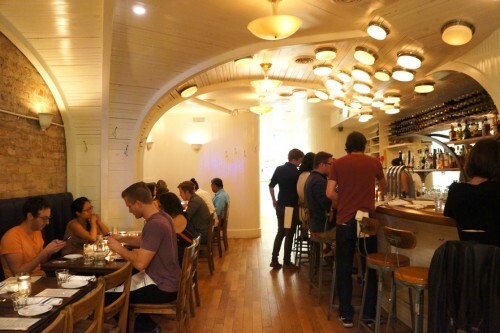 The food was excellent, the space was cozy and the staff were wonderful, particularly the bartender. I’m looking forward to coming back to try their brunch!